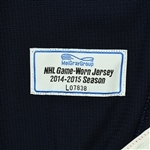 The Columbus Blue Jackets wore their Blue Set 2 jerseys from December 13, 2014 through February 13, 2015. 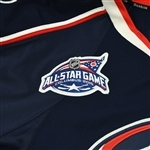 The Columbus Blue Jackets wore their Blue Set 3 jerseys from February 24, 2015 through April 8, 2015. 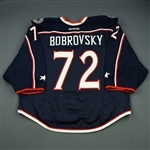 Bobrovsky wears one jersey per period and carried over all 3 of his Set 2 jerseys in to Set 3.